Apologies for the lack of posts lately - life got insanely crazy and I had to take some time to tackle all of it. I went to a wedding in New York City, finished studying for/took my graduate school entrance exam, and planned a trip for Nashville for the fall! I'm going to another wedding this weekend and gearing up to celebrate my birthday next week, so it doesn't appear that life will slow down anytime soon. Despite my brief leave of absence, I still managed to scrounge up some of the products I reached for the most during the month of June. Without further ado, lets dive right into them! Wet N Wild Photo Focus Foundation: I know, I know. I just mentioned this foundation in my May Favorites post. However, it's continued to hold up as my foundation of choice throughout June. It's easy to apply, looks natural on my skin, and maintains medium coverage. I have a feeling this will continue to be my go-to for quite some time to come! Coastal Scents Buffer Brush: Out of sheer laziness this month, I've been applying my foundation with a stippling brush over my Beauty Blender. Don't get me wrong - I still absolutely adore both my Beauty Blender and my Real Techniques sponge. I've just been forgetting to bring my sponge in tow with me when I stumble upstairs to cleanse my face at 5 am. This stippling brush also gives me the same natural looking finish that a sponge does. It's quite soft on my face and blends out foundation quickly and easily. Note that I received my buffer brush in a multi-piece brush set so the brush linked in this post is not the exact one that I own, but likely very close to it. 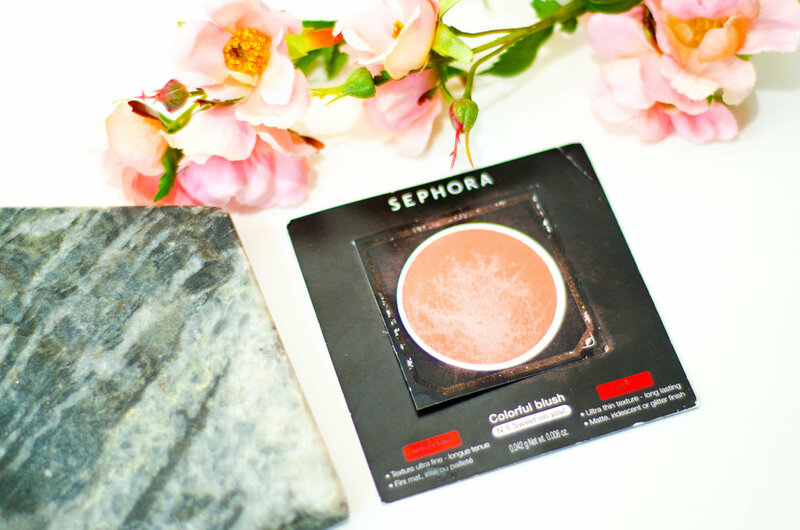 Sephora Collection Colorful Blush in Sweet on You: I've had this blush sample sitting in my stash for ages, but assumed it wouldn't be great quality for some strange reason so I always held back on using it. However, my presumptions were totally wrong! I really love this blush. It is just pigmented enough that it's easy to work with, yet not so pigmented that you inadvertently end up with clown cheeks. It lasts on my face all day which was a pleasant surprise! Sweet on You is a pretty coral shade unlike anything else I had in my collection. I will definitely be picking up the full size in the near future! Lorac Pro Palette: This was the second high-end eyeshadow I ever bought myself, following my the purchase of my Naked 2 Palette. As I began to collect more eyeshadow palettes, this one unfortunately got neglected. However, I've been reaching for it a lot more lately and was reminded how much I love the formula of these shadows. They're creamy, smooth, and blend effortlessly. I've been popping one of the matte shades in my crease and applying one of the shimmery shades to my lid nearly every day. The color selection within this palette is also fantastic - you can easily create many different looks with this one palette alone. The Lorac Pro has stolen my heart once again! Nyx Liquid Suede Cream Lipstick in Cherry Skies: I'll avoid going on my soapbox once again to sing the praises of the Nyx Liquid Suede formula (keep an eye out for an upcoming liquid lipstick post, though!) I've been wearing a lot of red lipsticks already this summer and Cherry Skies is the shade that I consistently reach for over all others. It's a gorgeous, cool-toned deep red that pairs beautifully with a huge range of makeup looks. I especially love using this to draw attention to my lips rather than my sloppily crafted eyeshadow that I applied half-awake at dawn. If you are a sucker for vampy reds, this is a must-have for your collection. So there you have it! These were my picks for my favorite products I used throughout June. What products have you been loving so far this summer? Leave a comment below!